The Imperial Military Order of St. George was instituted on the 26th of November, 1769 by the Empress Catherine the Great to reward both military and naval officers for exceptional bravery. It is necessary to have taken a ship from the enemy, – or a battery, or some strong position, – to have displayed extraordinary courage in defense, or by skillful tactics to have obtained or contributed to a Victory – to have offered as a Volunteer on a perilous enterprise, and executed it, – to have mounted the first in the breach in the storming of a fortress, – or, finally, when landing in the Enemy’s shore, to have alighted the first upon the beach. 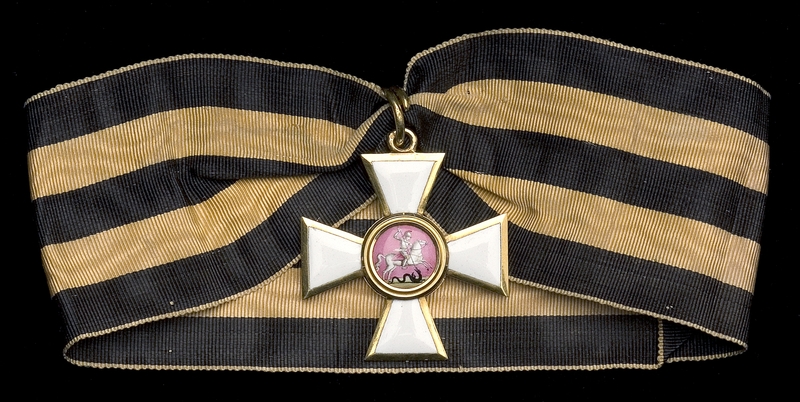 1st Class – Consisted of a sash badge and star. The sash badge of the order is a white enameled gold cross. The center of the badge is the Armorial bearing of The Grand Principality of Moscow, St. George in full armour, on horseback, slaying a Dragon – the cypher on the reverse is that of St. George. The star consists of gold rays and in the red center are the initials of St. George, surrounded by a blue circle with the Russian motto translating as “For Service and Bravery (1)”. The sash ribbon consists of three broad black stripes (edges and center) on an orange background. 2nd Class – Consisted of a neck badge (suspended from a neck ribbon) and the same star as the 1st Class Order. 3rd Class – Consisted of a smaller neck badge (suspended from a neck ribbon) without the star. 4th Class – Consisted of the same badge as the 3rd Class worn at the button hole on the left breast. 5th Class – Consisted of a silver cross awarded to subalterns and soldiers worn at the button hole on the left breast. Emperor Alexander I of Russia (Figure 1) awarded the Russian Orders of St. George, St. Vladimir and St. Anne to a significant number of Senior British Officers for Waterloo. Some background information is helpful to fully appreciate the significance of Alexander’s generosity in awarding these orders to “foreigners” for a battle in which the Russians did not participate. Figure 1 – Emperor Alexander I. Image from author’s archive. We only have to regress just a few years to Napoleon’s Russian Campaign of 1812 to appreciate Alexander’s bitter feelings towards Napoleon. On the 24th of June, 1812, Napoleon’s Engineers erected three bridges over the Neman River and his invasion of Russia began. Hoping to force Russia to cease trading with the United Kingdom, Napoleon underestimated Alexander’s resolve to fight on and not sue for peace. The enemy, with unequaled perfidy, threatens the destruction of our country. Our brave soldiers want to throw themselves on his battalions and destroy them; but we will not sacrifice them on the altar of this Moloch. There must be a general uprising against this universal tyrant….He has come with treachery in his heart and loyalty on his lips to enslave us with the help of his legions of slaves. Let us drive this plague of locusts out! Let us carry the Cross in our hearts, and steel in our hands! Let us pluck the fangs out of this lion’s mouth, and overthrow the tyrant who would overthrow the earth! Napoleon’s further incursion into Russian would cause much local suffering, including the Capture and Burning of Moscow. However, we know the eventual outcome was the virtual destruction of the invading French Army during the terrible retreat out of Russia in freezing snowstorms just 6 months later. Thus, the eventual demise of Napoleon was now a “fait accompli” and with it, the further resolve of Alexander to remove this “Corsican Upstart” from Europe. The war between France and the Sixth Coalition (Russia, United Kingdom, Austria and Prussia) formally ended with the signing of the Treaty of Paris on the 30th of May, 1814. In spite of Napoleon being exiled to Elba, many members of the Sixth Coalition still feared a resurgence of French power. Thus, when Napoleon escaped Elba, raised his armies and yet was soundly defeated first by Wellington’s forces, we can only imagine the elation and gratitude Emperor Alexander felt. One way of expressing this gratitude was his desire to reward Wellington and his Senior British Officers for their bravery at the Battle of Waterloo. I have the honour to enclose a list of Officers upon whom His Imperial Majesty the Emperor of Russia has conferred decorations of different classes of the Orders of St. George, Anne and Wladimir respectively, in testimony of His Imperial Majesty’s approbation of their services and conduct, particularly in the late battles fought in the Netherlands, which I beg your Lordship to lay before His Royal Highness the Prince Regent, and request His Royal Highness’s permission for them to accept the same. The following list of Senior British Officers accompanied the above dispatch as having received three classes of the Russian Order of St. George. Included is a short biography of their responsibilities and their individual acts of bravery at Waterloo. No 1st Class Orders of St. George were awarded to British Officers for Waterloo. Wellington did receive the 1st Class Order of St. George in 1814 from Emperor Alexander. Wellington’s 1st Class sash badge and star together with his British Army Gold Cross, Waterloo Medal and his other foreign orders are currently on display at Apsley House in London. Pray for the rest of the body, I beg. Figure 2 – Henry William Paget, First Marquess of Anglesey, K.G. wearing his 2nd Class Order of St. George. Image from author’s archive. On the arrival of General Hill…we all stood up and gave him three hearty cheers, as we had long been under his command in the Peninsula, and loved him dearly on account of his kind and fatherly conduct towards us. When he came among us he spoke in a very kindly manner and inquired concerning our welfare. 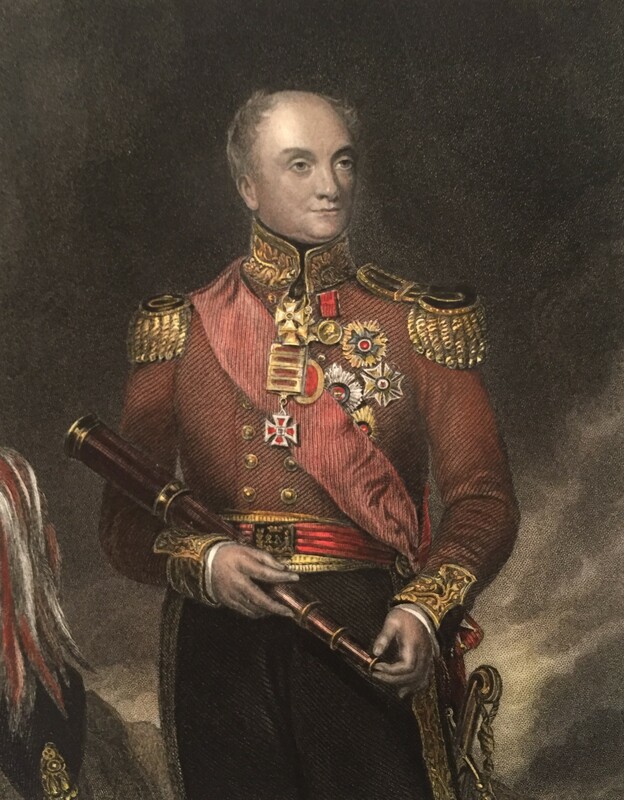 Figure 3 – Lieutenant General Sir Rowland Hill wearing his 2nd Class Order of St. George. Image from author’s archive. Lieutenant General Sir Henry Clinton – Clinton commanded the 2nd British Infantry Division at Waterloo. 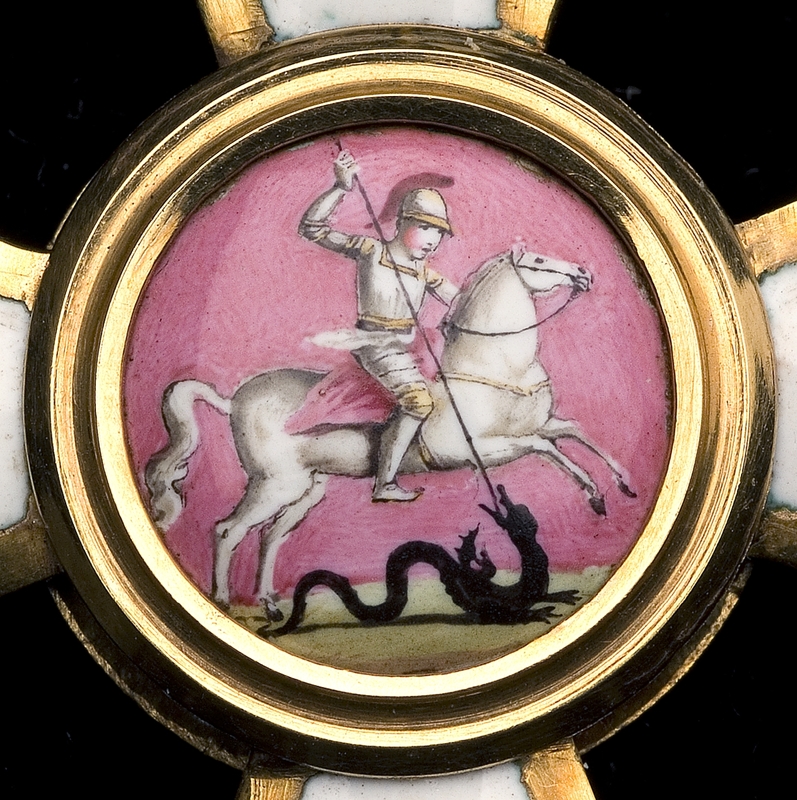 Clinton’s actual 3rd Class Order of St. George badge, shown in Figure 4, was sold at DNW (Lot 317) on September 25rd, 2008. Figure 5 shows the center of the Clinton’s 3rd Class badge, an Armorial bearing of The Grand Principality of Moscow, St. George in full armor on horseback slaying a dragon. The pink center background is typical for these early badges. While Clinton’s Division was held in reserve in the first part of the battle, they moved up into position mid-afternoon and aided the Guards Division in repulsing the Imperial Guard at the end of the battle by attacking their flank. Figure 4 – 3rd Class Order of St George awarded to Lieutenant General Sir Henry Clinton. Image courtesy of DNW. Figure 5 – Center of Clinton’s 3rd Class Order of St. George Badge from Figure 4. Image courtesy of DNW. Major General Cooke – Cooke commanded the 1st British Infantry (Guards) Division at Waterloo which solely consisted of four elite Guards battalions. His infantry was posted in and around the Hougoumont Chateau and played the principal role in the defense of this critical anchor point on Wellington’s right line. Cooke was to later lose his right arm and was not present during his Division’s famous repulse of Napoleon’s Imperial Guard which was the decisive point at the end of the battle. Major General Kempt – Kempt commanded the 8th British Brigade assigned to the 5th British Infantry Division under Lieut. Gen. Sir Thomas Picton at Waterloo. To understand how much the 8th British Brigade was engaged at Quatre Bras and Waterloo, you only have to look at the casualty figures – 1/28th Foot (45%), 1/32nd Foot (56%), 1/79th Foot (68%) and 1/95th Foot (36%). Kempt took command of the 5th British Division after Picton was killed leading his Infantry Division forward in a counter attack. Colonel Sir Colin Campbell – Colin Campbell served on Wellington’s Staff as Commandant at Headquarters in the Waterloo Campaign. Campbell’s actual 4th Class Order of St. George Badge, shown in Figure 6, was sold at DNW (Lot 318) on September 25rd, 2008. Campbell served with Wellington in India in the heat of the action. At Assaye, he had two horses shot out from underneath him and was severely wounded (5). He accompanied Wellington to the Peninsula where he served on Wellington’s Staff. For his services, he was awarded the Army Gold Cross with 6 bars and awarded a K.C.B on January 2nd, 1815. Figure 6 – 4th Class Order of St. George badge awarded to Colonel Sir Colin Campbell.. Image courtesy of DNW. He was at one time surrounded by several of the cuirassiers; but, being a tall and uncommonly powerful man, completely master of his sword and horse, he cut his way out, leaving several of his assailants on the ground, marked with wounds, indicating the unusual strength of the arm which inflicted them. Indeed, had not the ghastly evidences remained on the field, many of the blows dealt upon this occasion would have seemed borrowed from the annals of knight-errantry, for several of the corpses exhibited heads cloven to the chine, or severed from the shoulders. The issue of this conflict was, that the French cavalry were completely beaten off, and a great proportion of their attacking columns of infantry, amounting to about 3000 men, threw down their arms, and were sent off to Brussels as prisoners. Colonel Reynell – Reynell commanded the 1st Battalion, 71st Foot at Waterloo. Seven times the 71st formed square to repulse French cavalry attacks. The battalion would suffer 1 officer & 24 soldiers killed and 14 officers & 160 soldiers wounded. Reynell was to later command a division at the siege of Bhurtpore in the War of Ava (1824-6), and received the thanks of both Houses of Parliament (5). Colonel Sir Andrew Barnard K.C.B – Barnard commanded the 1st Battalion, 95th Foot (Rifle Brigade) at Waterloo. 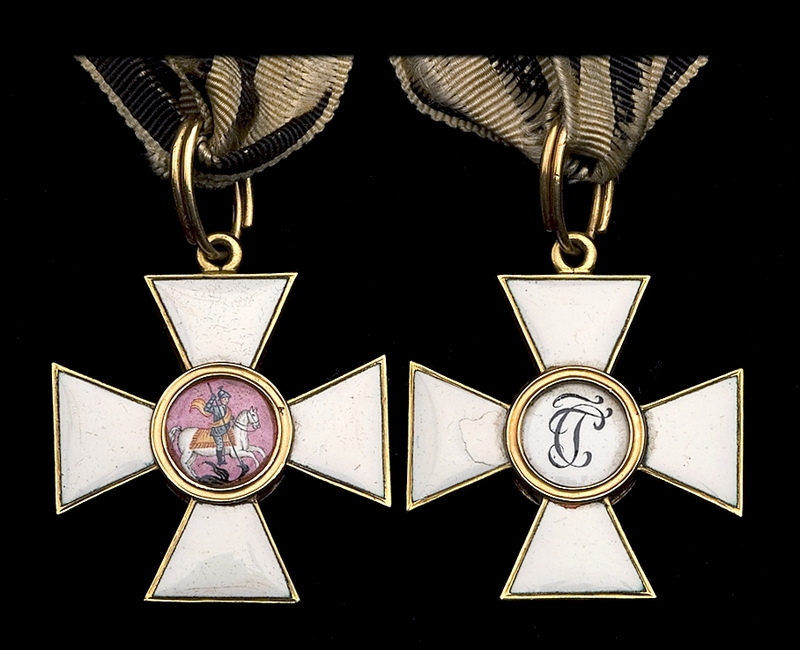 Barnard’s 4th Class Order of St. George together with the remainder of his British and foreign orders & medals were sold at Sotheby’s on the 30th of June, 1988. His orders and medals are now part of the of Royal Green Jackets (Rifles) Museum collection. Barnard’s six companies held the sandpit southeast of La Haye Sainte and the knoll further back in the center of Wellington’s line. While Barnard’s rifles were of great aid to Baring’s troops holding La Haye Sainte, it eventually fell later in the day. Colonel Hon. 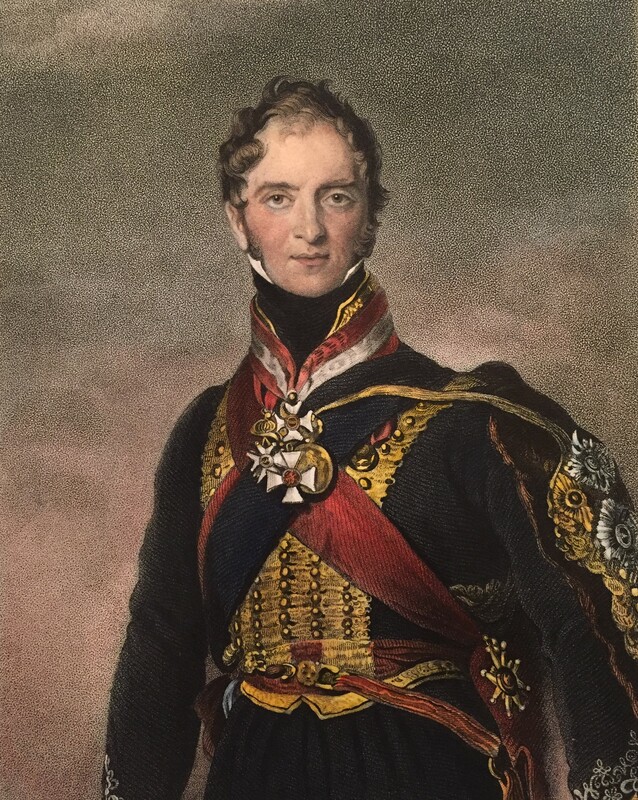 Alexander Abercromby – Abercromby of the 2nd Foot Guards served as an Assistant Quartermaster-General at Waterloo. Abercromby commanded the 28th Foot and a brigade in the Peninsular War and received the Army Gold Cross (5). Abercromby’s orders and medals were part of the Naval and Military Exhibitions at the Royal Scottish Academy Galleries (1889). Colborne, peerless among all the brave men who led Wellington’s battalions, coolly formed in line the 52nd, and without other prompting than that of his own genius for battle, advanced against their (Imperial Guard) flank. Checked thus by an unexpected enemy in front (for the British Guard had lain concealed from them by the crest of the hill), and surprised by the attack of the 52nd, they recoiled down the slope in disastrous confusion: and this the vigorous pursuit of Colborne, supported by other troops of Clinton’s division, by Vivian’s and Vandeleur’s horse, and by Chasse’s Dutch-Belgians (brought up by that general about 4 p.m. from the extreme right of the line), soon turned into a complete rout, which spread rapidly to their reserve battalions and the few remaining troops left about Napoleon’s center. Colonel Alexander George Woodford –– Colonel Woodford was the Second Major and highest ranking officer of the 2nd Battalion, 2nd Foot Guards (Coldstream) at Waterloo. He reinforced Colonel Macdonnell of the same regiment inside the Chateau of Hougoumont just before the 3rd French attack on this strategic position. The Coldstream Guards inside of Hougoumont, together with supporting infantry in the surrounding Hougoumont orchards, would amazingly fend off seven separate French attacks and hold this strategic location that anchored the right side of Wellington’s front lines. Wellington would later say “No troops but the British could have held Hougoumont and only the best of them at that (10)”. The evening came, and with it the Prussians. 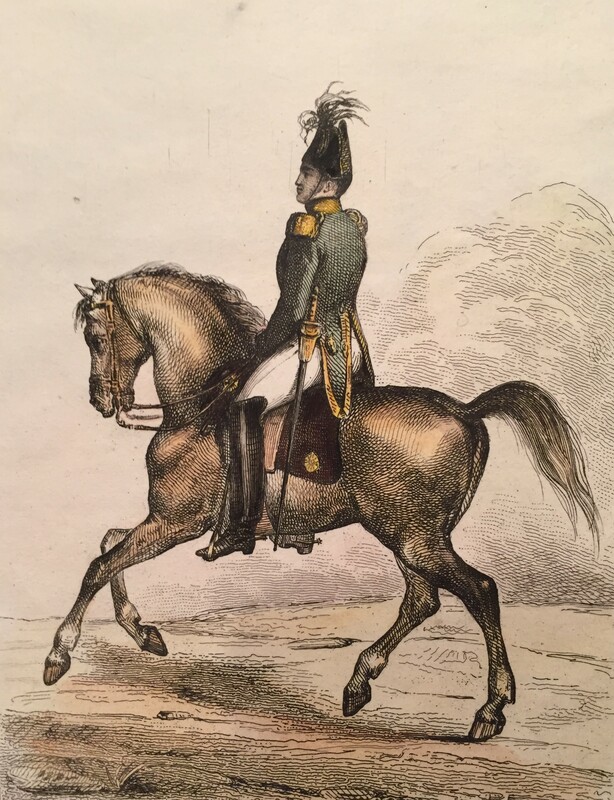 “Two squadrons of Prussian cavalry, both of them two deep, passed over me in full trot, lifting me from the ground and tumbling me about cruelly. A German soldier, bent on plunder, came and pulled me about roughly before he left me.” An English private next appeared, and on Ponsonby telling him who he was, the soldier picked up a sword and stood sentry over him. Next morning Ponsonby was removed in a cart to a farmhouse, and laid in a bed from which poor Sir A. Gordon had just been carried out dead. Col. Ponsonby had received seven wounds; a surgeon slept in his room, and he was saved by continual bleeding – 120 ounces in two days, besides the great loss of blood on the field. Colonel Felton Elwell Hervey – Hervey of the 14th Light Dragoons served as an Assistant Quartermaster-General at Waterloo. Hervey was with the “fighting 14th Light Dragoons in the Peninsula War where he lost his arm while in pursuit of the enemy fleeing from Oporto. He later commanded the regiment. Around 2 p.m., the cuirassiers of Wathier’s 13th Cavalry Division advanced to the left of the Brussels high road, in support of d’Erlon’s infantry columns, toiling ahead on the right. The cuirassiers had pushed beyond La Haye Sainte when they were hit by the charge of the Household Brigade, including Sir Robert Hill’s Royal Horse Guards. During the melee that followed, Sir Robert found himself surrounded by five French cuirassiers, his life in imminent danger. The situation was retrieved by the timely intervention of Private Evans from Captain Clayton’s Troop, who hacked down four of Hill’s assailants, at which point his sword snapped. Evans reputedly laid the fifth Frenchman low with the hilt. Lieut. Colonel Lord Fitzroy Somerset– Somerset of the 1st Regiment of Foot Guards was Military Secretary on the Duke of Wellington’s Staff at Waterloo. He would lose his arm from a shot fired from the top of the La Haye Sainte farmhouse after its capture from the French. He would later be known as Field Marshal Lord Raglan, Commander-in-Chief of the British Army in the Crimean War. He died during the Siege of Sebastopol in a farmhouse overlooking the plains of Balaclava (5). Lieut. Colonel Lord Saltoun – Saltoun served in the 1st Regiment of Foot Guards at Waterloo. While Colonel Woodford of the Coldstream Guards was inside the walls of Hougoumont Chateau defending against the French onslaught, Saltoun commanded the Light Companies of the 1st Guards Brigade defending the Great Orchard on the northeast corner of the Hougoumont Chateau. During the fierce fighting, Saltoun had four horses shot from underneath him outside the walls of Hougoumont. Dalton’s Waterloo Roll Call states that “Towards the close of Waterloo day he returned to his place in the line with about but one-third of the men with whom he had gone into action. He then took a prominent part on the last celebrated charge of the Guards.” Saltoun would rise to the rank of Lieutenant General and command a brigade in the war with the China War of 1842. These Waterloo heroes receiving the Order of St. George were just a small portion of the British Officers given honors by grateful Emperors and Kings of the various Allied Nations. It is understandable as the bloody Battle of Waterloo signified the climactic end of the Napoleonic Wars after 15 years of bitter fighting. More blogs postings on other such Allied awards for Waterloo will come in the weeks to follow. This blog was outstanding. I really enjoyed reading about the experiences of these heroic officers at Waterloo. The descriptions really brought their experiences to life. It also reminded my that leaders in these times led from the front and shared in the risk faced by their troops. This blog was beautifully written and is the best and most interesting I have read to date. My hardy congratulations on a wonderful contribution to all of us who share your interest in history and in the awards granted these historic personages. Thanks Rick – The stories regarding the sacrifices made and the courage these soldiers exhibited is captivating. Rather than flipping through dull history books, I much prefer reading about their stories in the “first person” though the letters and the biographies written during their campaigning and/or after their return to England.